From the MLS: This iconic residence is reportedly the 2nd most photographed home in the United States after the White House. 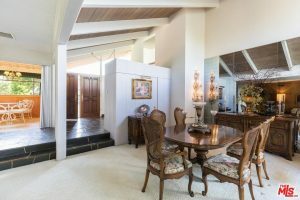 Featuring perfectly preserved 1970's decor, it boasts one of the largest lots in the neighborhood-- over 12,500sqft. Enormous, lush backyard gardens & lawn, completely private & serene. Located on a quiet residential block, property also borders the Los Angeles River, which is a unique street-to-river orientation. 2 Master Suites, one up/one down plus generous entertaining spaces that flow uniformly from one to the next and to the outdoors. Gated motorcourt plus large separate garage provide parking convenience.Whether inspired by the TV family or the real life surrounding neighborhood, this residence is a perfect postcard of American 70's style and its special culture. The cast of "The Brady Bunch" inside the interior of their home, set in studio. (Photo: PARAMOUNT PICTURES CORP. 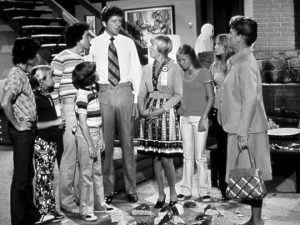 The half-hour sitcom created by Sherwood Schwartz revolved around mom Carol Brady (Florence Henderson), her husband, Mike Brady (Robert Reed), and their blended family of six children. 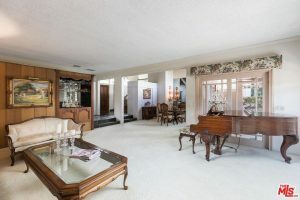 Pictures of the home, constructed in 1959 according to the listing, show it has maintained its vintage aesthetic, though not the one featured on the show as the series was filmed in studio. 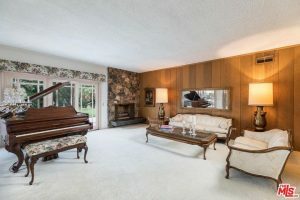 Wide wood paneling adorns the walls of a room in the listed property featuring a piano and a stone-covered fireplace.